One thing I’m thankful for is the incredible people I’ve met through this blog — not to mention all the amazing comments you have shared. It’s so gratifying to know that others are inspired by this blog, so … thank you! Keep those comments coming! Here’s wishing you all out there in internet-land a happy and healthy Turkey Day. 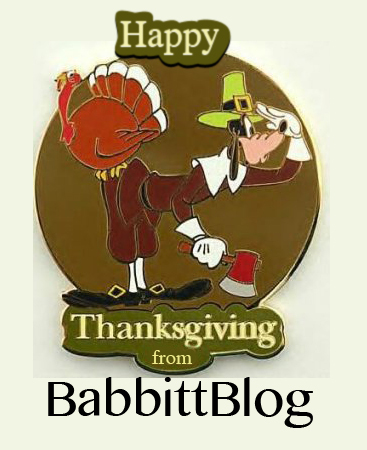 This entry was posted in miscellaneous and tagged Disney, Goofy, Holiday, pin, Thanksgiving. Bookmark the permalink. Just discovered this blog. I’m a big Disney fan but all I knew about Babbitt was that he was a talented artist, friend of Tytla, and had a falling out with Disney because of the strike. There’s obviously a lot more to the story as you show on your pages. It’s a subject that cries out for a book in order to present a more complete picture of an obviously complex man.